Looking for business security? Look no further! Key duplication, access control, and structural door hardware are only a few of the services and products available with Harvey's Lock & Security. If your company suffered a security breech or property crime, how would you be affected? The repercussions can be devastating! At Harvey's Lock & Security, we know the importance of protecting your business. Whether you're looking for high lock installation and security key duplication or complete business security options, let the folks at Harvey's help you choose the security measures that are right for your business. Selecting security options can be overwhelming. You know business security is important, but how do you know what's right for you and your business? Begin by considering what assets you need to protect. Do you have products, documents, or money you need to lock in a safe at night? How many entry points does your business have? 90% of break-ins occur through the back or front door, but in some businesses it's just as important to take internal business security precautions. Next consider your preferences. What sort of business security do you prefer – mechanical door hardware or electronic security? 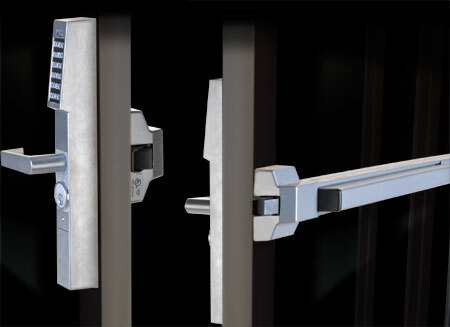 If you choose mechanical door hardware, consider what sort of locks you want. Will your business use various locks? As you consider your business needs and personal preferences, make a list of questions and important information. Once you've made a list of initial needs and preferences, we will be able to guide you and recommend security options based on your unique needs.